With an explosion of sophisticated, targeted attacks that lead to costly data breaches, system downtime and lost productivity, today’s data centers have never been more threatened. An uptick in virtualization, software-defined data centers, cloud storage and hyperconverged platforms have presented enterprises and end-users with a whole new set of storage and data security risks and regulations. 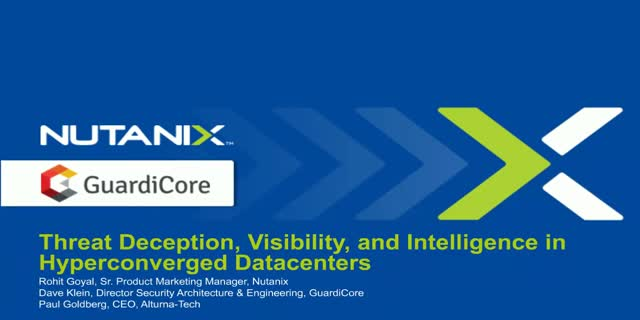 Together, Guardicore and Nutanix enable a secure, software-defined infrastructure for virtualized environments. Virtual machines and applications running on the Nutanix enterprise cloud are protected via Nutanix's security-first design & automation. Guardicore’s advanced security platform adds application-layer visibility and high-interactive threat deception. •What are the latest threats and risks facing today's data centers? •What are Nutanix and Guardicore doing to mitigate these risks?